The key reason that Murray State lost this game was that they got out-rebounded 38-29. And it was the Blue Raiders' bench that made the difference. Murray State's Starters outrebounded Middle Tennessee's starters 19-18. But the Blue Raiders got 16 rebounds from their bench to the Racers' eight. They also had four team rebounds to Murray State's two. Of course there were other factors. Murray State fell behind late in the game and lost their poise at times. Jonathan Stark was double teamed on the Racers' final possession but he did not give the ball up. He wound up forcing a 3-pointer which he missed badly. Both teams played good defense, especially on the perimeter. 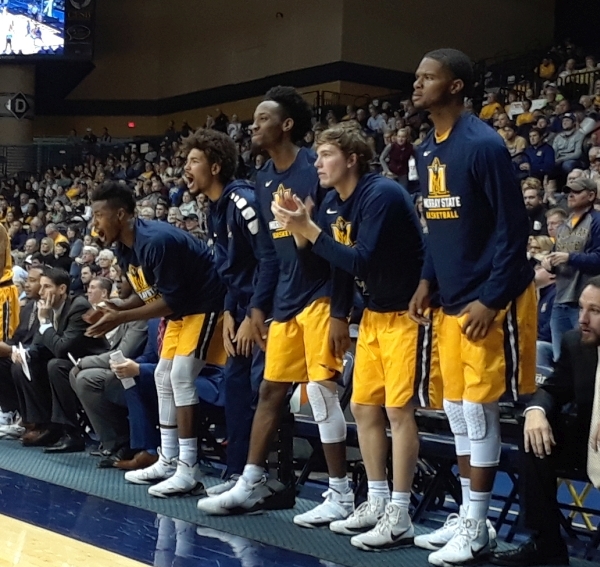 Middle Tennessee made just 1-of-12 3-pointers and the Racers hit just 3-of-16. Middle Tennessee alternated between a 1-3-1 zone and man-to-man. Their height made it difficult for Murray State's guards to throw over the top of the zone. But the Racers had some success taking the ball to the basket. Ja "The Truth" Morant led the Racers with 16 points and was 9-for-9 at the free throw line. Jonathan Stark had 14 points and Terrell Miller had 11. Nick King led the way for Middle Tennessee with 31 points. The Racers were an eight point underdog according to the Massey Ratings but they only lost by five. The results so far suggest that they are a little better than the ratings indicate. They are currently a six point underdog against Wright State on Saturday.